On Friday 2 February 1968, I was relaxing at home when I received a phone call from the Duty Commander at the Ministry of Defence in London. "Are you the 2i/c of the Portsmouth Bomb & Mine disposal team?" Blackfriars Bridge. What are you going to do about it?" I told him that I could have my team on the road in less than an hour. "Right. Go to the Thames River Police HQ at Wapping. They have all of the details." 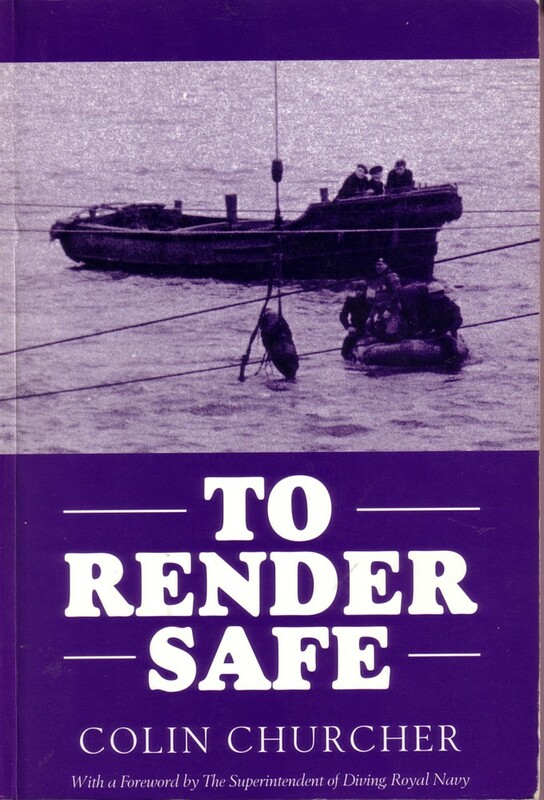 I called my CPO Diver to get the rest of the team into HMS Vernon and to start loading the Landrover with diving gear, explosives and tools. An hour later we were on our way, blue lamp flashing and two-tone horn sounding. As we were passing Petersfield, a motorcycle cop drew up alongside us and asked, "What's the hurry?" I told him and he said, "Follow me." reservations. It frightened the life out of me but we arrived at Wapping Police HQ in record time. Here I was briefed on the situation. A civilian diver, who had been working on the suction end of a pipe for a factory on the North Bank had stumbled across what he was faily sure was a bomb. 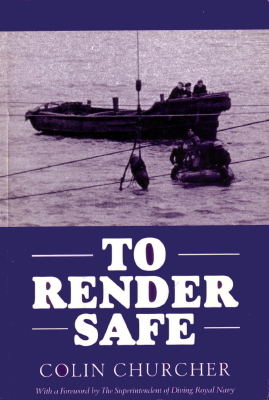 He had removed his marker line, which was attached to a buoy on the surface, and had secured it to the object. We then loaded our gear into the police launch, and went up to the site of the object. We spent the time preparing our diving gear. I called the Port of London Authority to ask whether they could provide a barge with a lifting crane if it became necessary. Tthey said that they would have one ready. Just before 0300, we moved back to the bridge. I decided to dive from the police boat and use our Gemini inflateable dinghy as the safety boat. I also opted to make the first dive to ascertain whether we had a bomb disposal operation or a false alarm. The depth at low water was about 50 feet. As soon as I entered the water, I knew it was not going to be easy. I swam to the marker buoy and started down. After descending only 10 feet, the visibility reduced to zero. l carried on down to the river bed until I came to the object that the line was tied to. As soon as I felt it I knew it was a bomb. It was two thirds buried at an angle of about 30 degrees. The river bed had a crust three inches thick under which was gooey mud. With my knife, I dug the crust around the bomb. Pushing my arm down the side of the bomb, I felt the fuze pocket. The fuze did not seem to be damaged. On the other side, I felt the slinging point where it had been suspended from the aircraft. I recognised the feature as German from my training and reckoned that we had a 500 lb German bomb. I gave the signal that I was returning to the surface and started up. On my arrival, I gave a briefing to the team and sent two divers down to do a bit more digging but told them not to knock the bomb or move it from its current angle. The tide had started to flood again, so they would only have about 15 minutes. The next slack water would be at 0900 and I decided that we would carry out the lift at that time. I called the divers up and we returned to Wapping. We had a busy time for the next four hours. 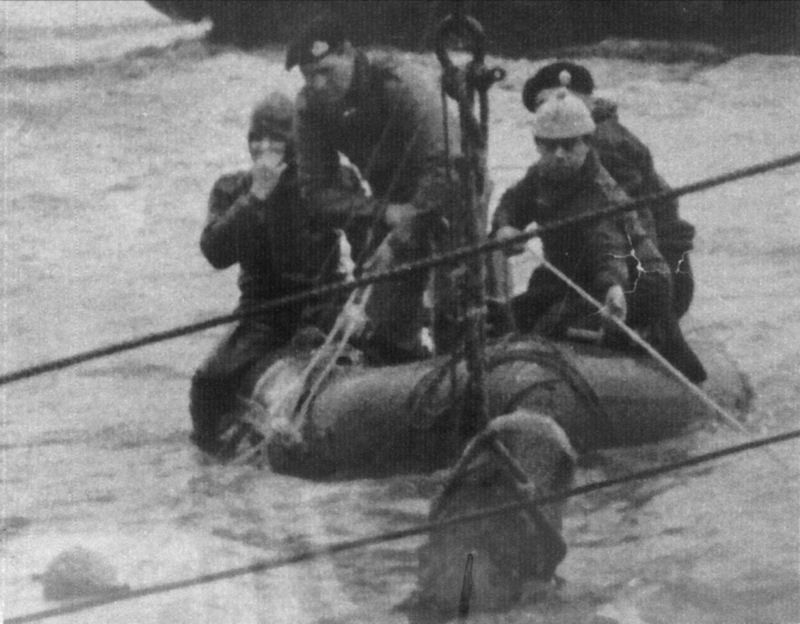 I tasked the divers with making a rope sling which we could fit around the bomb, with a ring at the top where we could secure the lifting hook. It was very important that the bomb was kept at the same angle because, as we had been unable to see the fuze,any difference in the attitude of the bomb might start it counting down again. I consulted my manual and confirmed that it was a 550 lb German bomb. I tried to guess why it hadn't exploded and I thought that because the nose had not hit anything solid; just the water then soft mud. The impact had not been sufficient to activate the fuze. I then contacted The Port of London Authority and asked them to provide a lifting craft at Blackfriars Bridge at 0900. I also called the City of London Police and they agreed to close Blackfriars Bridge to all road and rail traffic during the lift, to stop all river traffic in the area and to evacuate the north bank of the river for 500yds in all directions, the hazard radius of the bomb. They also attached a Police Inspector with a radio to my team. We started diving again at 0945, just before high water. The first task was to fit the lifting strop to the bomb and I sent down the Chief and the Leading Seaman to do this. When they had completed their task, I went down. The bomb had silted up again but was still at the same angle. The idea was to keep it at this angle until it was finally disposed of. I checked the bomb. It was still at the same angle and the strops held it safely so I returned to the surface. By 1045, all of the safety restrictions had been implemented and the lift began. At 1120 the bomb broke surface. It was the first time that any of us had seen it and I was glad to confirm that it was still at the same angle. My team had used the salvage vessel's fenders to make a nest into which we were able to lower the bomb and keep it at the same angle. Our Gemini was hoisted on board and we started our journey down the river. Using his radio, the police inspector had every bridge and river tunnel closed as we passed. It was amazing to see empty bridges with all of the traffic waiting at each end. At 1630, we were one and a half miles off Southend Pier and the depth was 60 feet. I decided that this would be an ideal position to countermine the bomb. The ship stopped and we lowered the bomb to the sea bed. The team moved into the Gemini and a diver went down to unhook the crane whereupon the salvage vessel moved about a mile away. We secured a 4 lb pound pack of plastic explosive to the bomb and linked this to the Gemini with Cordtex detonating cord. All shipping in the area had been warned that there would be a large underwater explosion. I checked that there were no small boats in the area and then ignited the two-minute fuze. We moved the Gemini 200 yards away. There was the rumble of a full order explosion and a white plume of water rose 100 feet into the air. The bomb had been destroyed. The following week, the Lord Mayor of London invited the team to a civic luncheon at the Mansion House. By Webmaster: Colin was subsequently appointed an MBE (Ordinary Member of the Honourable Order of the British Empire) for this operation. His life story can be read in his autobiography, To Render Safe, which he relates in the third person about a character called 'Dave'.